When I equipped my first workshop some years ago, funds were a little restricted and there was a necessity to make a limited amount stretch as far as it would go. To that end, one of my purchases was a small, blue, Bosch router with a 1/4in collet and very good it was too, serving me well for many years. With subsequent retirement came some rather nice, additional extra funds and a further chance to re-equip the current workshop with bigger capacity, more robust machinery, one of which was a replacement for my ageing blue Bosch router. Leafing through the current online tool catalogues and after much pondering and sleepless nights - with continual comparison of specifications whirring round in my head - the choice of router eventually, by quite a large margin fell to the lime green and black tool from Germany - the Festool OF1400. This proved to be a revelation and a huge 'step up', a little like moving from a clapped out, smoky BMC Mini to a fat-wheeled, low slung, top-of-the-range Porsche. So it was with a sense of imminent anticipation that I accepted an invitation from the editor to 'test drive' the Festool VS 600 dovetail jig, which was delivered shortly afterwards, together with a selection of finger templates and cutters for various jointing applications. 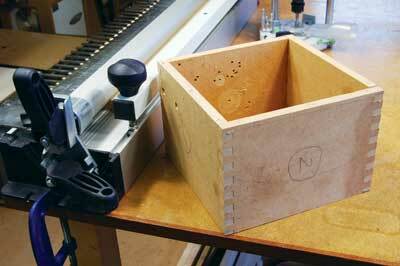 The templates included one for dovetailing and two for making 6mm and slightly larger 10mm box joints, together with their respective cutters. 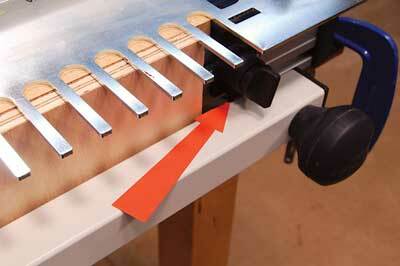 In common with many similar dovetailing jigs where a router is used, both parts of a dovetail joint are cut simultaneously, cramping one section vertically and the other horizontally. 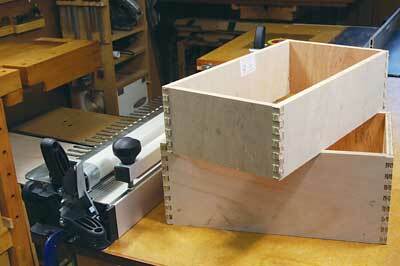 Box joints are cut with both pieces cramped firmly against the front pressure bar. The router is then set to the correct depth of cut and passed between the 'fingers' on the template to cut both parts of the joint at the same time. 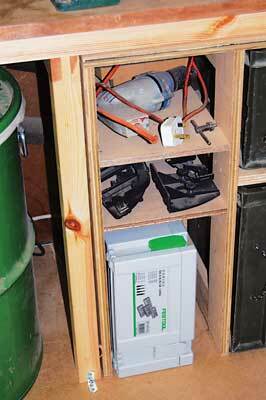 Rather than make a series of test joints, I thought it would be useful to make a couple of boxes to fit under a unit in the workshop, one to hold my Wolf Sapphire power drill - possibly the best ever British made drill - and a second box to hold the various attachments for my Festool Domino. 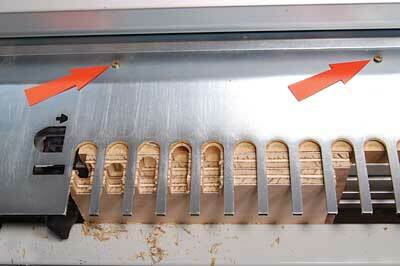 I intended to use the FZ10 template to make the parallel finger joints for the boxes. That's the theory and it works well enough, although in practice using the VS 600 proved an entirely different kettle of worms! Each of the templates supplied is provided with a specific Copy Ring, which is designed to fit between the protruding fingers of the template. The Copy Ring is simply screwed into the base of the router and a conical mandrel fitted into the collet, which is there solely to make it dead central â€“ a nice touch and one which ought to work very well. However, it became immediately apparent that the Copy Rings supplied with the templates were not intended to fit the OF1400 router as they were too small and the obvious conclusion is that the VS 600 jig is intended to be used with the much smaller OF1010 router. My suspicion is that any prospective buyer of a Festool router would opt for the more desirable OF1400 - as I did - with its powerful motor, bigger capacities and comfortable size. At the time of my purchase of the OF1400, it wasn't supplied with an 8mm collet and as all the cutters for the jig were 8mm I was at somewhat of a loss in proceeding with the test. It was only the very timely and rapid intervention of Axminster Tool Centre -who sent me the requisite parts - that enabled me to continue the evaluation. The new Copy Ring supplied for the FZ10 template was a slightly different pattern in that it clipped into place on the base of the router, rather than being screwed in position, meaning that the centring feature of the mandrel could no longer be used. The jig is secured to the work surface with either a couple of screws or is clamped in place with some small 'G' cramps. 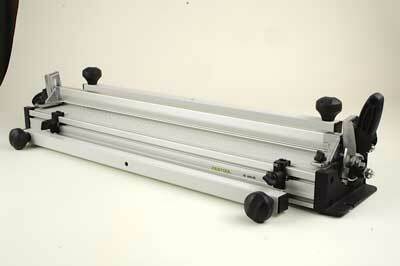 A separate handle is supplied in the box which locks the main swivel segments of the jig in place and this must be fitted before use, though Festool, in their wisdom, fail to provide a suitable, thin walled, box spanner to tighten the Nyloc nut. I did manage it, but it took a long time. The correct tool would have made the task infinitely easier! The template is fitted next by opening both clamping levers - one at each end - sliding it into position and then tightening in place with a couple of rotary knobs. 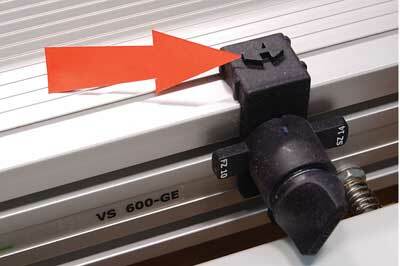 The multi-function stops are then positioned at each end and turned to the appropriate setting, in this case FZ10, aligning the stops so that the arrows lie against the inner straight side of the notches in the template. The template is then raised and a splinter board - softwood or similar - inserted underneath and screwed into place. 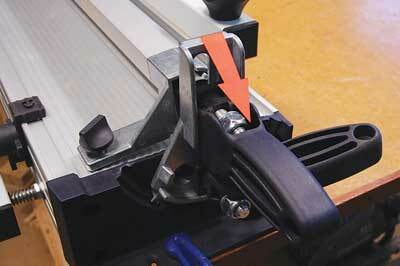 Once the splinter guard is secure and in the correct position, the template is pushed down and the clamping levers closed by lifting towards the vertical. The jig is now ready for the insertion of the timber to be cut, but at this point something alarming happened because the whole template moved around 1mm to the right as the clamping levers were raised! As the stops effectively position the timber relative to the template they were now in the incorrect place and had to be repositioned again by eye after the template was cramped. With everything now set up correctly, the timber to be cut can be positioned against the front pressure bar and stop so that both parts of the joint can be cut. In order to maintain a constant pressure, a similar thickness of material needs to be cramped at the other end, but if the thickness isn't great enough, the pressure bar engages on the right-hand side stop before the timber. Prior to cutting the joints for my two boxes, I thought it prudent to have a 'trial run' with some very old and tatty bits of MDF and managed to produce a reasonable set of joints, after which I felt confident to proceed with the actual job. 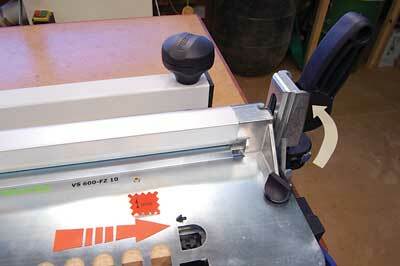 Using the jig is fairly straightforward once every thing has been set up. 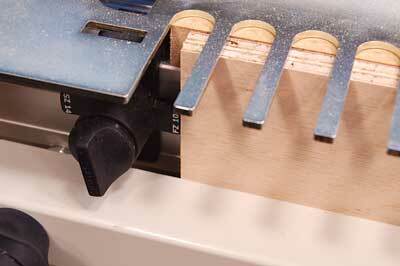 To use, slide the router between each of the fingers to make the cut, having firstly set the correct depth of cut. In using the OF1400 though, another slight, though irritating problem nonetheless was encountered as the router hit the fixing screws for the splinter board. 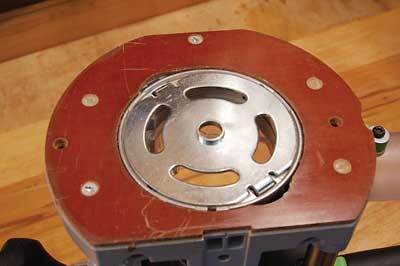 The holes aren't countersunk, so the screw head sits proud of the template, with the consequent fouling. 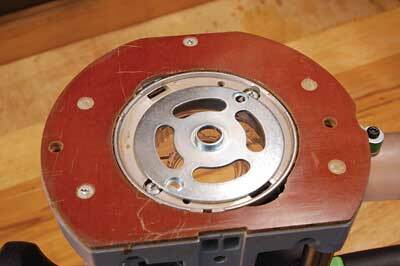 The only solution is to remove the screws and re-position them in another of the four available holes in the template. Although I was unable to verify it, it's probable that the smaller OF1010 router wouldn't come into contact with the screw heads. Although in theory it would seem possible to cut two pairs of box joints at once - using the cramped timber at each end of the front pressure bar - in practice, very close examination of the instructions on page 24 of the leaflet reveals that this is not possible. Both parts of a corner box joint must be cut individually and the timber then positioned again against the appropriate stops. The boxes were successfully made though not without some distinct problems in adjusting the jig. 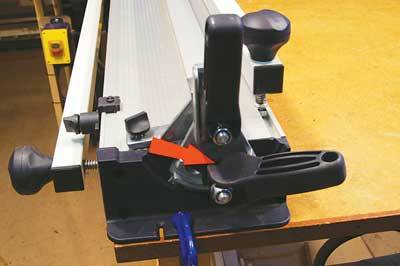 The intention was, in addition, to use the other cutters supplied with the VS600 to cut a set of dovetails on another box or drawer, but the mis-matching of the OF1400 and Copy Rings meant that I was unable to take the test to its ultimate conclusion. I have little doubt that using the smaller OF1010 router would negate many of the problems I encountered with the jig with the exception of the ones I found. These sorts of jigs come into their own when a lot of dovetails - or box joints - need to be banged out quickly and accurately, but for the bespoke furniture maker producing an individual piece, traditional hand cut dovetails are always going to be preferable. 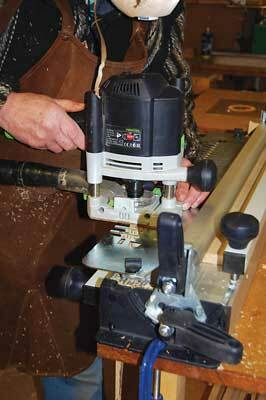 In common with many other dovetail router jigs of this type, the Festool VS 600 will cut swift and accurate joints once correctly set up, though it takes some adjusting to get spot on. It appears it is meant to be used with the smaller router - the OF1010 in particular, though. I found that the bigger OF1400 causes some problems, the main one being that additional Copy Rings are required for each template with the subsequent extra cost.